😇😊😋The main ingredients in this sweet are various nuts. This sweet contains high protein and iron, calcium, etc. Intake of one or two laddus per day fulfills regular calorie of protein needed for our body. This sweet will be loved by all and liked by children and elders. Roast all the nuts in a pan separately. Roast the sesame seeds to pop up. let them cool. Peel off the cardamom, separate the seeds and crush the seeds. Add the cardamom seeds to dry roasted nuts. Grate the Jaggery Grind all the nuts and sesame seeds and cardamom seeds in a mixer coarsely. Mix all the coarse powder of nuts together and Jaggery grates well in a large pan. Add ghee. Mix well. Make round balls. 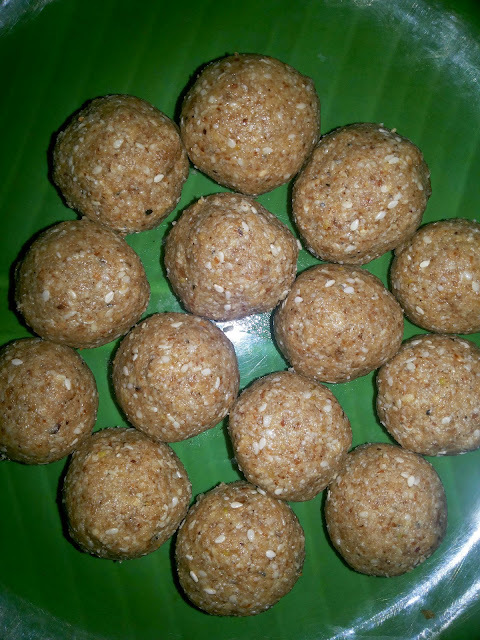 You will enjoy this simple and quick laddu.